The SugarCone Blog is brought to you by SugarCone Biotech Consulting - Click to learn more about what we can do for your company. Last week I posted a holiday reading list (link). I’ll be posting brief summaries of some of the more interesting papers over the next week or two. - Interesting papers on the power of whole exome and targeted gene sequencing – and a large number of patients followed for a long time – to uncover putative initiating cancer mutations. These can be termed initiating in the sense that they predate the occurrence of malignancy. - Both studies identified somatic mutations in peripheral blood mononuclear cells that occurred more frequently in patients who developed hematological malignancies than those who did not. - Here is a peak at some of the data. This first figure is from the paper out of Benjamin Ebert’s lab at Brigham & Women’s Hospital, Harvard Med School, Boston. On the left we see the 10 most commonly detected mutated genes, on the right the distribution of mutated genes per patient – overwhelmingly just one (Fig.2 from Jaiswal et al. 2014). Notably, however, the top three genes are the same (Fig. 2 from Genovese et al. 2014). 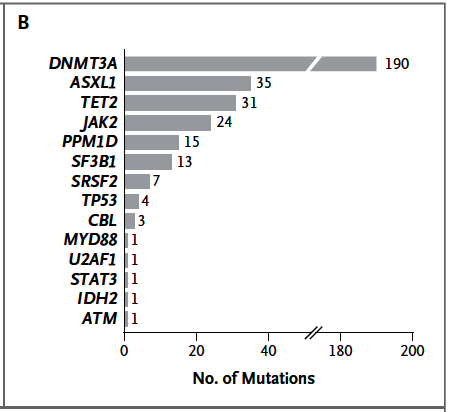 Many of the other mutations are in genes well studies in the context of hematological malignancies (JAK2, IDH2, MYD88) and other tumors (TP53, STAT3). The differences are mainly in the rarer mutations and reflect statistical noise, the difference in patient populations studied, or both. - The top 3 somatically mutated genes are various types of DNA transcriptional regulators. This suggests that the drivers for these malignancies are actually the targets of the activity of DNMTA3 (a DNA methyltransferase), TET2 (a methylcytosine dioxygenase) and ASXL1 (an epigenetic regulator). All three had been previously identified as mutated genes in patients with various lymphoid and myeloid malignancies, however these new studies show the mutations to be present and stable years before cancer develops. 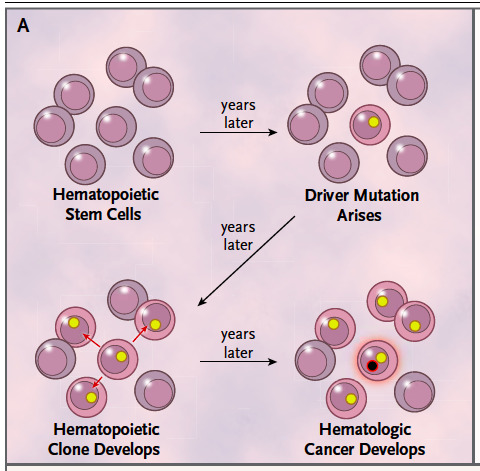 Thus clonal hematopoiesis evolves from one of the initiating mutations. The association with survival is not only due to the link with cancer: mutations in these transcriptional regulators appear cause other physiologies as well. The Ebert paper finds an association between age-related somatic mutations and cardiovascular disease for example. I’d caution here that this paper studies patients already predisposed to develop cardiovascular disease, and so this association might wash out in general population studies. Regardless, the relative risk of carrying one of these somatic mutations is not large, so it is not as if we should all run out and get these genes analyzed. - Finally, and this has been known for a while, mutations in these transcriptional regulators are really problematic once cancer develops, and that is shown by the impact on overall survival post-diagnosis. This last point is very intriguing as it suggests that somatic mutations in transcription regulators do two distinct things, probably via action on distinct targets – one, predispose to hematologic oncogenesis and two, allow mutations to accumulate once oncogenesis has taken place. “Several important research directions could bring DNA sequencing for clonal hematopoiesis closer to clinical usefulness. First, some somatic mutations are likely to be associated with a particularly high risk of subsequent cancer; larger studies could identify such mutations. Second, single-cell analyses might identify high-risk combinations of mutations occurring in the same cells. Third, the sequencing of specific cell types might identify mutation–cell-type combinations with increased predictive value. Fourth, initial detection of clonal hematopoiesis might justify periodic screening for the presence of cooperating mutations at low allele frequencies that could presage cancer”. I would add that a more detailed understanding of how somatic mutations in the DNMT3A, TET2, and ASXL1 genes trigger and support oncogenesis may yield downstream targets suitable for therapeutic intervention. Biotech Due Diligence Resources for the Biotech Enthusiast, dedicated to making you a better biotech investor. Chimera Blog – Free Insights & Analysis Chimera Research Group provides completely independent and actionable investment and trading. In the Pipeline Blogger Derek Lowe has worked for major pharmaceutical companies on drug discovery projects against schizophrenia, Alzheimer’s, diabetes, osteoporosis and other diseases. Life Sci VC Blogger Bruce Booth is a Partner at Atlas Venture focused on helping start and fund emerging biotech therapeutics companies. MassBio HQ Massachusetts Biotechnology Council – Blogspace for dynamic dialogue with the life sciences community. The Big Red Biotech Blog News on trends and issues in the biopharm and pharmaceutical industry. Commentary on current events, clinical pipelines, facility expansions, competition, technology, legal and economic matters. Enter your email address to subscribe to the SugarCone blog and receive notifications of new posts by email.